I think it’s definitely work appropriate, as long as it’s clean and maintained well. But, then again, I worked in a professional setting and always wore neon green, black, silver glitter, et cetera… Maybe it just depends on the general climate of the office? Sorry to hear you’re sad, but I look forward to the “work friendly” polish articles because I work in conservative professional environment and I’ve recently started wearing polish. As for the colour grey, I think it depends on what grey you choose, on your skin tone, your wardrobe colours and style, and your specific work environment. 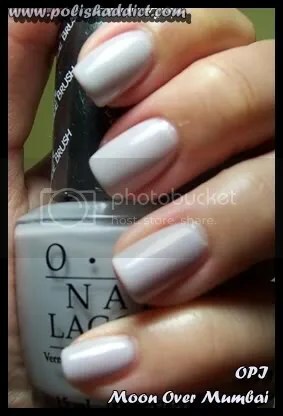 I’ve recently worn OPI Yogata blue on my (small) toenails with professional brown trousersuits and “conservative” open toe shoes. Frankly, it looked really good with my weekday office suiting and my weekend funky green sandals. It’s a beautiful deep blue that you can dress up or down. Grey is not a good colour for me, but I bet there are some versatile greys out there. pretear, I agree that blue pushes the envelope in most offices. I looked at alot of blues. I wouldn’t have been able to wear any other that I saw: too shimmery or outright frost, funky undertones, too bright, too shiny, too mod. Also, I wouldn’t have done my fingernails in blue. Just my small toenails, for little slivers of colour, at some distance from most eyes. yeah, I definitely think it depends on what kind of work you have etc.